I am absolutely positive that I am incapable of writing a summer novel. I am also absolutely positive that Nancy Thayer can. And…she does it with skill, knowledge and just the right amount of juicy bits. 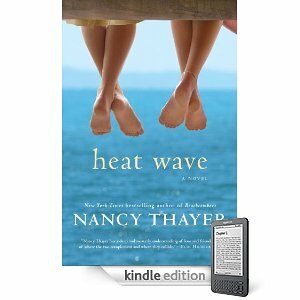 Heat Wave is this summer’s Nancy Thayer novel. I was able to get a copy from Amazon Vine. The true start of summer for me is accumulating great summer books from authors like Nancy Thayer and Claire Cook and Jane Green. I eat them up like candy. Give me a Nantucket or Maine or Cape Cod setting and some families with issues and I am glued to my book. Add a B & B setting and some friends and some rigid in-laws and an itty bitty bit of infidelity…this says winner to me. In a nutshell…Carley and Maud and Vanessa are three great friends who live on the island. Their families are close, their lives are intertwined and everyone is happy. Then a husband dies suddenly, an affair is made known and the three friends are no longer close. The rest of the book is about recovery and growth and pain and love. All of this is in a luscious Nantucket setting. I sort of could not put it down. I love Nancy Thayer’s knowledge of Nantucket and I love that she writes about real places there. I googled them. This was a lovely fun book. It was never slow for me. I felt the issues that Carley and Maud and Vanessa faced were real ones. The juicy bits were not even graphic…you could almost rate this book G.
If you just want to read about real friends that could be yours or mine…this summer book is a great one. I Love And Don’t Love Monday’s!!! “Real friends that could be yours or mine…” Love it. You certainly made it sound wonderful. I am a sucker for setting. Oh, I absolutely can't wait for this one! I've preordered it for my Kindle. Did you get an e-book from Amazon Vine? On my Potpourri blog, you asked if I order more books because of Kindle, and the answer is a resounding yes. I haven't read any of Thayer's work, but this sounds really good to me. Sounds like a great summer novel, Patty!